On your knees, Plebeians! Kneel before the mighty power of the rock! Declare thy reverence for the grandeur of the electrified guitar, the rapture of perfectly recorded reverb, the commanding power of the kick drum! And, um, really moody vocals from this Texas dude named Brandon Whitten! 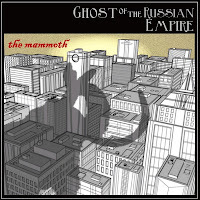 Be thou humbled to encounter the sheer sonorous perfection of modern shoegazers Ghost of the Russian Empire, or their mammoth new full-length, uh, The Mammoth, shall not be unleashed before thine ears! Seriously, though, this independent release by the Texas quartet fronted by Whitten is one hell of an album. It's got that sound -- that staggering, powerful combination of primal R'n'R ingredients exemplifying the form at its most artfully transcendent. Countless bands have been influenced by guitar-fuzz auteurs like My Bloody Valentine, but what puts Ghosts of the Russian Empire so far ahead of the pack? Maybe the decision to use wizardly producer Erik Wofford, who worked similar sonic magic for The Black Angels. And it could be the molten churn of electric guitars heating up this platter, some of which were obviously played by Whitten, but Jason Pike and Ruben Anchondo (both credited on guitar/bass) also contributed. Then there's Whitten's haunted vocals, placed at a distance in the mix -- usually behind waves of reverb -- so you can't hear the lyrics very distinctly (although they're printed on the insert). But you can sure feel the emotions. There's something heavy in the air, these songs tell you, and it befits this band's unique moniker, which evokes the fall of something mighty and the disturbing residue left behind. The disc offers a series of shadowy, unsettling musical portraits, and you don't need to decipher a single lyric to get utterly spooked and mesmerized at the same time. "Dark" is a gripping slow burner that features the sort of chord changes for which discerning ears are always grateful, while Whitten's keening voice hints at unspeakable tragedy. The mood continues with the incredible "Dresden," which sounds for all the world like Neil Young and Crazy Horse had Neil suddenly taken a coffee break and let Kevin Shields take over. Just listen to Mike Plata's Ralph Molina-like drumming, and the beautiful crunch of the guitars. A totally unexpected tempo change then elevates this track to genuine classic status. "In the Borough of a Beast" is aptly named, with its piano and ominous beauty evoking a rapidly darkening sky. But "The Black Mark" might be the highlight of this remarkable platter. It begins with crisp acoustic guitar, then turns into an atmospheric tour de force that finds the band playing with incredible clarity of purpose, like they're lugging some hugely important object up a steep hill with the weight divided four ways, perfectly. The lead electric guitar cries out with transcendent beauty; it's some of the best axe work on any recent album.